This is a sponsored post written by me on behalf of Tampico Beverages. However, all content and opinions are entirely my own. Please see my disclosure policy. Captain Underpants isn’t your typical superhero. He’s slightly dimwitted and sometimes disastrous, but he fights against evil with a huge heart and seriously silly pranks. Oh, and he’s sporting underpants under that cape. Which is precisely why everyone in our home loves him! After years of success in book form, Captain Underpants came to the big screen on June 2nd in Captain Underpants: The First Epic Movie! And in celebration of their partnership with DreamWorks Captain Underpants, Tampico is giving away awesome prizes and hosting super fun games to help you and your kids #UnbottleLaffter. Follow Tampico on Facebook so you don’t miss any of that fun. We decided to celebrate the new Captain Underpants movie and #UnbottleLaffter, too, with a Silly Family Superhero Puppets Straw Craft to drink our Tampico Beverages with. 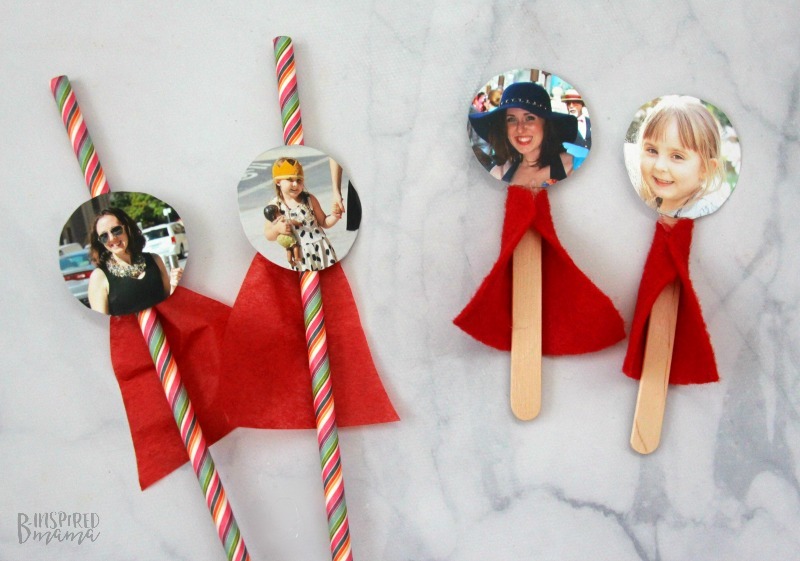 You can make these silly puppets on craft sticks if you’d like, but I’d highly recommend doing this straw craft with paper drinking straws so you can use them to drink your yummy Tampico beverage of choice. Plus, they help everyone know who’s drink belongs to who! Trace a small circular object (like a bottle cap) over the faces in the family pictures to ensure that they are all even, perfect circles. Cut out circles. Cut out squares of the tissue paper or felt. Fold the squares in half and temper the edges to form an exaggerated A-shape for the cape. Place a small line of glue 2/3 of the way up on the straw or craft stick. Wrap the top, smallest edge of the cape around the line of glue. 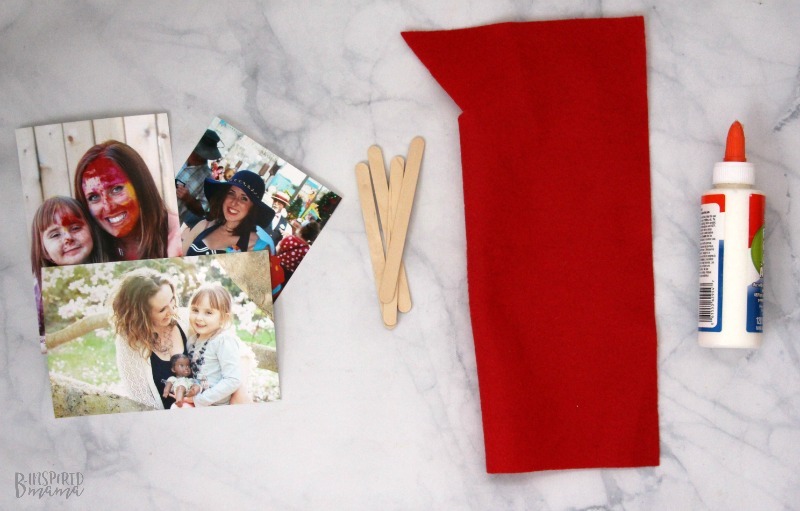 Add an extra dab or line of glue to the front top third of the straw and place the photo circle on top of the glue. To add more “superhero powers” use stickers, construction paper, and glue to add superhero emblems just under the faces. Repeat with all straws or craft sticks. 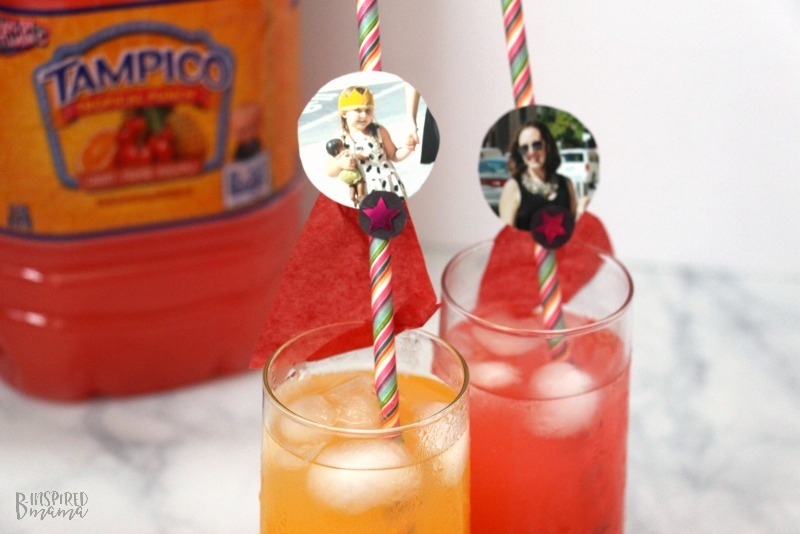 Let the glue dry fully before using straw crafts with your drinks! 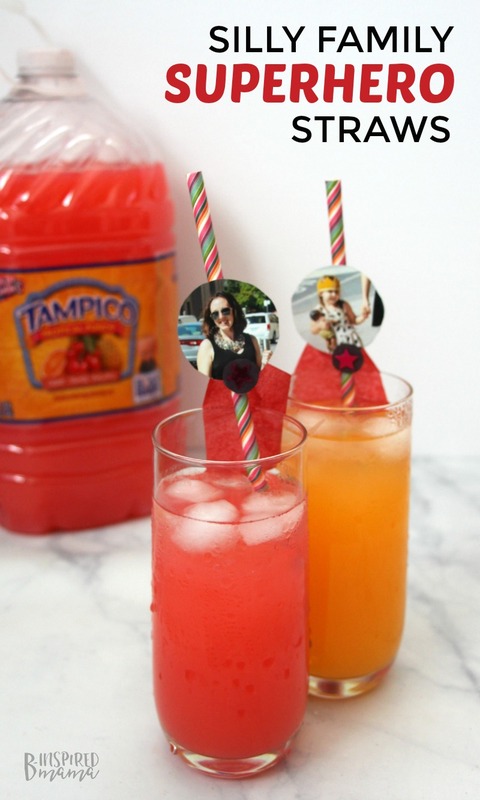 #UnbottleLaffter with Your Family Thanks to Tampico! I hope you get a chance to have some silly family crafting fun, too. In partnership with DreamWorks’ animated comedy “Captain Underpants: The First Epic Movie,” Tampico Beverages, one of the world’s leading beverage brands, is introducing its “Unbottle Laffter” contest. Participants can enter now through 11:59 p.m. EST July 13 by visiting Tampico’s Facebook Page and commenting on a contest post. The first 20 entrants to respond to a contest post will receive a family pack of movie tickets. Additionally, every entrant will be automatically entered for a chance to win the Grand Prize: a pair of tablets for laughing, learning and enjoying life together. The grand prize winner will be announced July 14. Participants are also invited to enjoy Tampico’s Prank Board, a collage of hilarious sounds in the style of Captain Underpants. Every two weeks, visitors of Facebook.com/DrinkTampico may enter the contest by providing creative responses to irresistibly silly superhero requests posted to the page. The first 20 entries to every contest post will be awarded with a family four-pack of movie tickets valued at $50 via Fandango. Every participant is automatically entered into the sweepstakes for the Grand Prize: a pair of tablets (Large “Superhero” and Mini “Sidekick” size). The Prank Board can be accessed by all at: UnbottleLaffter.tampicoiscolor.com. Participants must be age 17 or older to be eligible. For more information, including no-purchase entry, visit TampicoIsColor.com. Waooo! What an attractive and lovable idea! Perfect for summer.